Empireoption is quickly becoming one of the industry’s most reliable and most innovative binary options brokers. This broker is the first to be regulated by private and governmental entities, and caters to European, South American, and American clients. Their educational resources and trading tools are among the industry’s best binary options brokers. It’s safe to say that empireoptions is a force to be reckoned with. There are five types of accounts which empireoptions clients can choose from. All empireoptions account types can operate in every trading mode and give traders their very own empireoptions trading profile. The Micro empireoptions account offers traders weekly financial analysis and reports, one trade book, one seminar, for a minimum deposit of $200. The Classic empireoptions account comes at a minimum deposit of $500 and gives binary options traders daily financial analysis and reports, two trade books and seminars, access to EmpireTV, special promotions, access to the economic calendar, and the first unit of trading strategies. For a minimum deposit of $1000, traders qualify for the Empire Plus empireoptions account. Along with daily financial analysis and reports, clients get a personal account executive, three trade books and seminars, EmpireTV, a market simulator, trading signals, as well as the first unit of trading strategies. A deposit of $5000 qualifies traders for the Preferential empireoptions account, which grants them all of the perks of the Empire Plus account, with an additional one trade book and seminar, two extra trading strategy units, and a one-to-one session with an account executive. The highest of all account types, the Empire VIP empireoptions account is available for deposit of over $20000 and offers all of the perks of the aforementioned account, with a total of five trade books and seminars, an immediate withdrawal deadline – Empire VIP empireoptions account holders also have the empireoptions team at their disposal at all times. The promotions at empireoptions are always being updated, with the latest one being an iPad offered to all empireoptions account holders who deposit over 4k. The empireoptions platform is powered by Spot Option and while it carries that generic binary options platform look, it cannot be denied that it is a highly efficient and user-friendly platform which empireoptions has improved by bringing many unique tools and features to the table. The empireoptions platform contains four binary options trading types: High/Low, Options Builder, One Touch, and 60 Seconds – short term trades can vary from 30 seconds to 60 and 120 seconds. You can tell that when the broker was developing the empireoptions platform with Spot Options, they placed a great deal of attention to detail. It is extremely easy to use and the general layout is very pleasing on the eye – the best way to put it is to say that the empireoptions platform is used to its fullest potential. One of the most important and impressive features of the empireoptions platform is the iFollow feature. This straightforward tool allows traders to copy successful trades executed by other empireoptions account holders. It is similar to other social trading platforms in the way that one can copy other traders’ signals and trades. This is ideal for beginners as well as traders who want to take new strategies for a test drive, or just want to see if they can perform as well as their counterparts. www.empireoptions.com offers an impressive array of educational materials. “We create professional brokers” is enough to tell you that you’re in safe hands. Seminars, trade books, signals, one-to-one sessions and much more are what to expect from this top-of-the-line broker. Empireoptions’ customer support staff is at their clients’ disposal around the clock via live chat, phone, and email. This is another area in which this broker does not disappoint. 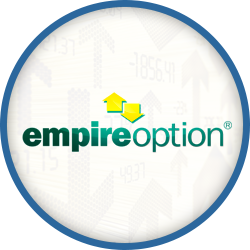 www.empireoptions.com is a binary options broker which simply deserves to stand among the industry’s best brokers – they are perfectly suited to accommodate novice traders and professionals. Simply put, they undoubtedly give traders their value for money, not least for the empireoptions platform.